Bobby Borg and Michael Eames, two of the authors of Five Star Music Makeover: The Independent Artist’s Guide for Singers, Songwriters, Bands, Producers, and Self Publishers, sat down with Taxi TV Live to talk music publishing, promotion, and more. Taxi TV Live provides interviews with songwriting tips and music business information along with special interviews with industry guests, and more. Be sure to take a listen below. I didn’t think a book with five authors would be this good. Interviewer, Michael Laskow, had an amazing conversation with both Bobby and Michael who provided deep insight and tips to the music industry, promotion, and for all those up-and-coming artists out there, how to survive. Five Star Music Makeover is an engaging all-in-one guide designed specifically for aspiring artists. Written by five experts with over 100 years of collective experience, both on and off the stage, this unique book covers five key skills every musician needs to succeed: (1) improving vocal production/technique; (2) writing memorable and marketable songs; (3) recording your ultimate EP; (4) navigating the publishing world; and (5) promoting music effectively. In addition to Bobby Borg and Michaels Earnes their are three aditonal authors: Eric Corn, Anika Paris, and Coreen Sheehan. As for who wrote what, Anika covering writing music, Eric, recording; Coreen, performing; Michael, licensing; and Bobby, promoting. This interview covered everything from motivational tips for an artist to attract an audience to branding themselves. There was discussion of royalties, licensing, pay to play. If you’re into music, of course this interview is for you, but for those with hopes of becoming an entrepreneur, the information shared goes beyond that. In the music business of today, as the independent DIY, you need all these skills; you need t be aware of them. The interveiw was an amazing, organic conversation that’s definitely a must listen! Check out the interview in its entirety here. “Five Star Music Makeover” giveaway! Courtesy of Music Connection, five lucky people will be given the chance to win the book, Five Star Music Makeover The Independent Artist’s Guide for Singers, Songwriters, Bands, Producers, and Self-Publishers! Music Connection is an online publication that has grown from a popular print publication into a spectrum of products and services that address the wants and needs of musicians, the music tech community and industry support services. To enter and learn more about the giveaway, click on the link below! In order to achieve success in today’s music industry, artists must first do a great deal of work on their own. Learning the required skills can take years of real-life experience, and hiring personal coaches, studio professionals, and consultants can be costly. But now, for the first time, there’s an invaluable resource to help you meet these challenges. Five Star Music Makeover is an engaging all-in-one guide designed specifically for aspiring artists. Written by five experts with over 100 years of collective experience, both on and off the stage, this unique book covers five key skills every musician needs to succeed: (1) improving vocal production/technique; (2) writing memorable and marketable songs; (3) recording your ultimate EP; (4) navigating the publishing world; and (5) promoting music effectively. Also included are insiders’ stories and anecdotes, helpful tips, creative exercises, celebrity interviews, and all the practical expertise necessary to develop a successful music career. Five Star Music Makeover is a complete and practical career guide – a resource that transforms artists from good to great. Five Star Music Makeover Team at NAMM! The Five Star Music Makeover team will be in The NAMM Show this weekend! Coreen Sheehan, Anika Paris, Bobby Borg, Michael Eames, and Eric Corne have teamed up to create this guide for singers, songwriters, bands, producers, and self-publishers, and will at the Hal Leonard Book on Saturday at 1:30 p.m. to tell you all about it. Check out the video below for more details! Also included is a link to a DVD master class, insiders’ stories and anecdotes, helpful tips, creative exercises, celebrity interviews, and all the practical expertise necessary to develop a successful music career. Five Star Music Makeover is a complete and practical career guide – a resource that transforms artists from good to great. 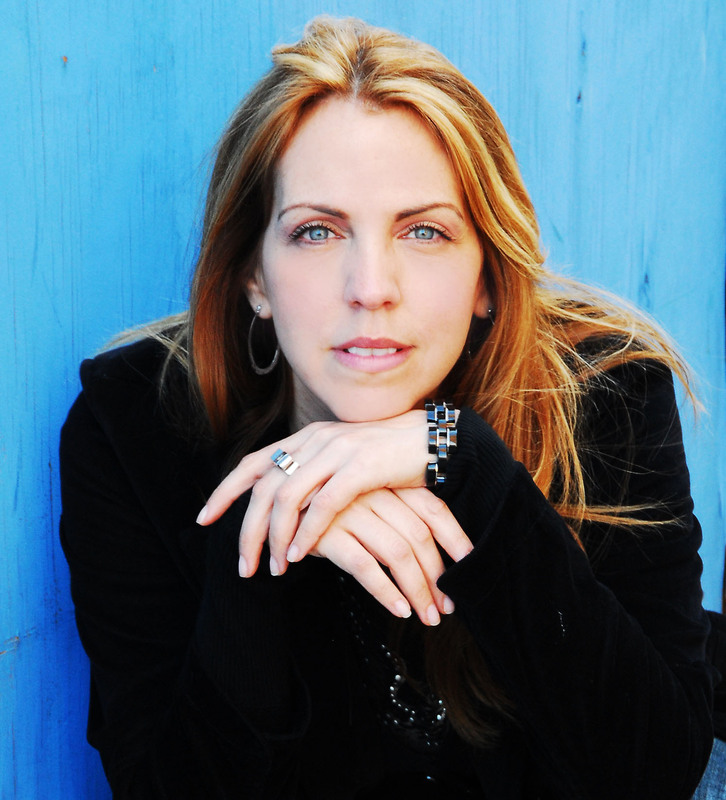 Guest Blogger: Anika Paris, author of Making Your Mark in Music, reports on her new musical playing Off-Broadway through December 23rd. Temple of the Souls is a story about the virtual extinction of the native Taino people by Spanish colonizers in 16th-century Puerto Rico. Directed by Lorca Peress and produced by Multistages, this production is playing at the West End Theatre in NYC Dec 8th-23rd to rave reviews. Order tickets here. 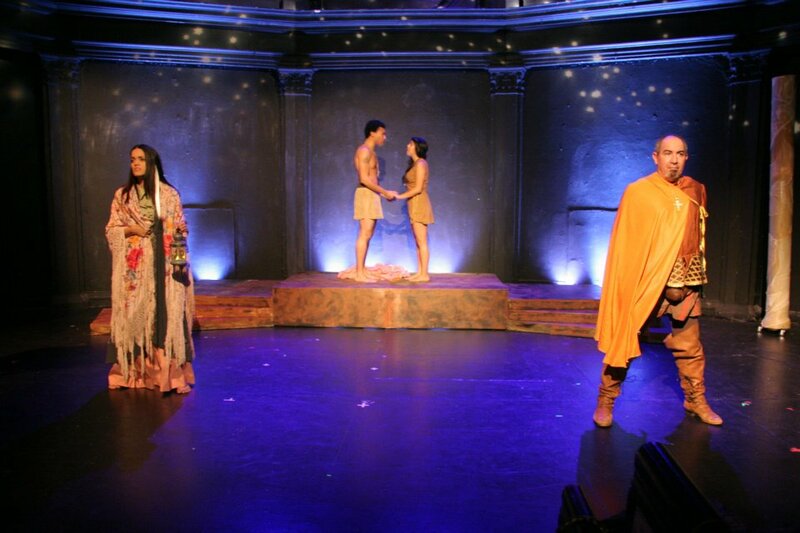 Playwright-lyricist Anita Velez-Mitchell and composers Dean Landon and Anika Paris (Paris also contributes some additional lyrics) use a “Romeo and Juliet” love affair between a Taino man and the daughter of a conquistador to depict the tragic consequences of that cultural collision, which they achieve with passion and clarity. Director Lorca Peress makes the scenes involving the central characters crisp and pointed…The most successful element in “Temple of the Souls” is its score, which is filled with accessible melodies in an Andrew Lloyd Webber vein. “I’m Not Dreaming,” a duet sung by Amada and Guario, is as achingly tender a ballad as I’ve heard all year. MultiStages can be proud for having introduced us to this songwriting team. I hope we hear more from them. The fact that the collaboration ended up “all in the family” was not the initial plan. There was originally another composer who backed out of the show due to time conflicts. Lorca, my sister, had been developing the script with Anita, my grandmother, for about a year, and called to ask us if we’d be interested in composing Anita’s opera. We are contemporary songwriters first and foremost. And Opera is a skilled specialty. So we all spoke with the understanding that if Dean and I composed the music, it would lean more toward a classical pop feel in the realm of Sondheim or Andrew Lloyd Weber. This would change the direction and style of the show, but we would navigate our way through the process. After we hung up the phone, we went into the studio and wrote the finale. It was as if the words and music were floating off the page and into the air, taking on a life of their own. 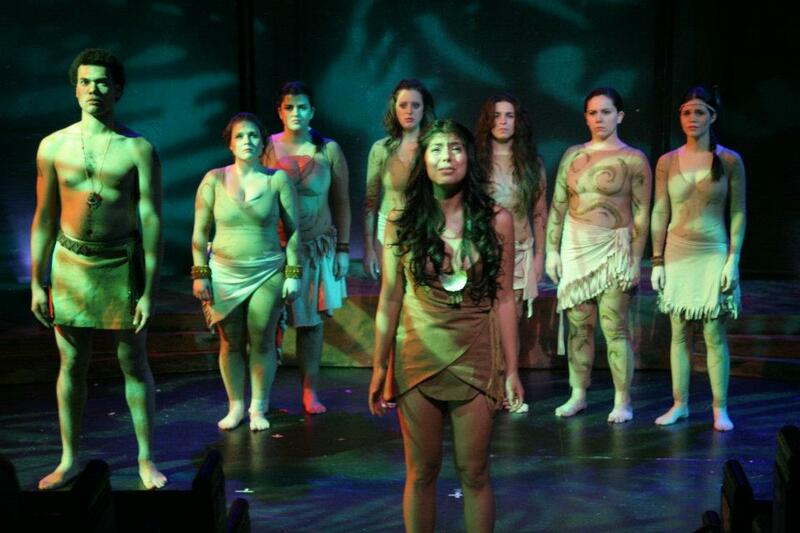 There was an unheard message in the history of the Taíno people and we were telling it. We sang every vocal part ourselves; bass, baritone, tenor, mezzo, and soprano, even hitting a high C, and then collapsed. After listening back, we knew we were onto something magical. And now two years and twenty songs later we have completed a musical drama premiering Off-Broadway. Like Temple of the Souls on Facebook. Making Your Mark in Music by Anika Paris is available from Hal Leonard Books and book sellers nationwide. Since the age of seven, Anika Paris has been playing piano and writing songs, as well as singing and performing. Making Your Mark in Music re-creates the nurturing approach that she experienced growing up with a symphonic conductor father and a poet mother. Three solo records, songs in film and TV, touring the world, and ten years of teaching have all led to this authorship. Making Your Mark in Music serves as a personal mentor for the reader through stories and trade secrets passed down to the author over the years. This book, one of the very few on stage performance for musicians, blends psychology, Eastern philosophy, the art of conversation, and performance techniques valuable to performers of all levels. It reveals the inner workings of performance from an artist’s perspective while also functioning as a self-discovery and artist-development journal. Included is a closer look on DVD of the author coaching artists, with before and after footage of each performer. The book also reveals what many readers want to know, through interviews with industry professionals. Record executives answer the question, “What exactly are you looking for?” A psychologist explores who we are and what role we each play in music. An image stylist talks about how to best fuse fashion with music. A television host discusses how to keep the audience tuned in. And a sound engineer explains how to keep the music playing. 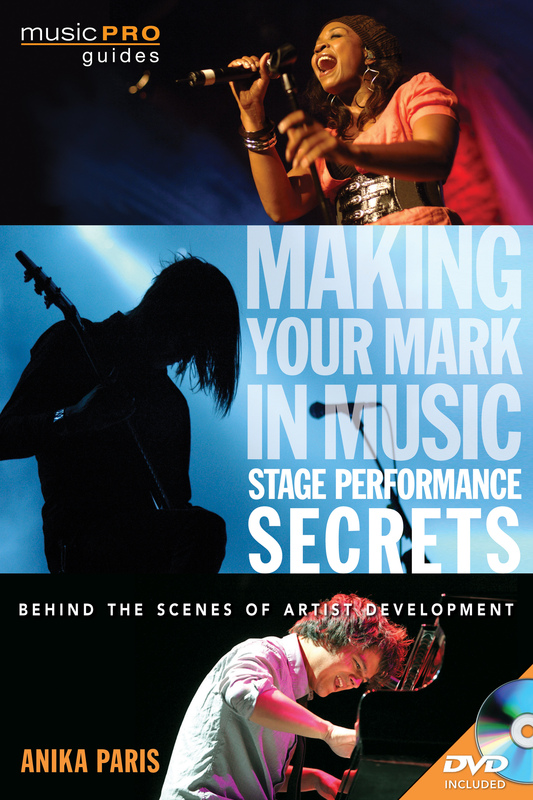 Find all of this and more in a book that will help you make your mark in music.